I love the feeling after a happy practice. 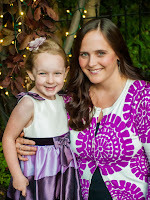 I we are able to go the full length of a practice without having a melt-down I give my daughter a hug and ask if she likes playing the violin. She always says yes! Here is a chart to help have THREE weeks of happy practicing. This is great for someone who likes to draw. If you want to download this chart click here. 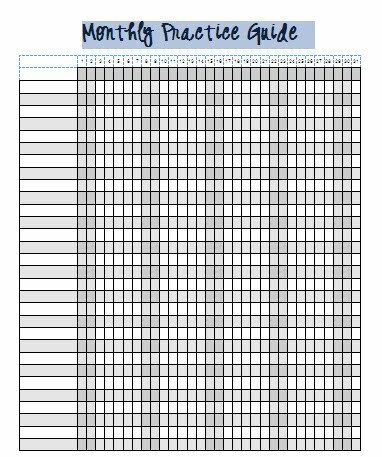 Scroll down to "Draw a Face 21 day practice chart.pdf" and download. I was thinking yesterday about how I'm trying to give advice about practicing on this blog and yet I really don't have the amount of experience as so many moms out there. I have one child doing violin and piano and that's it. My son was doing piano but we had to quit (but I'll talk about that later.) However, I feel that if I chronicle my ups and downs perhaps someone can get some inspiration, advice, or even comfort knowing that practicing with a child is hard. I think the reason why she is so successful at learning the violin so fast is that we have been doing repetitions on every piece since she started the violin. I took her teacher very seriously from the start when she said play a spot 50 times per day. I'll tell you - we did it 50 TIMES every day. It probably wasn't until the end of Book 3 when we had SO much to practice that I would be a little lenient on the overs and overs. But I believe that she now has a brain that can do overs and overs so easily. So, if you want a tad of advice. DO THE REPETITIONS! It's hard at first but then it becomes habit. It's the only way to really learn a piece well. Professionals do it! Nobody is ever too good to play the hard spots over and over! I was at a Suzuki Leadership Retreat and a friend of mine gave me a box of practice helps that she sold at institute years ago. Inside were these little review magnets. It's just a list of all the songs in Suzuki Book 1. I put them on my magnet board and have my daughter move one over each time she plays one. She's in Book 4 so reviewing Book 1 isn't happening like it was two years ago, but she still needs to go over them. The best part is that she's playing these pieces just beautifully! She adds dynamics or phrasing where she thinks it would sound good. Her vibrato is ringing through all the pieces. I'm amazed at the quality of sound that is coming out of these easy pieces. THIS IS WHY REVIEW IS SO IMPORTANT! She is learning to become expressive and dynamic with her playing on these beautifully easy pieces. I have more of these. If you want some let me know and I'll get them to you! 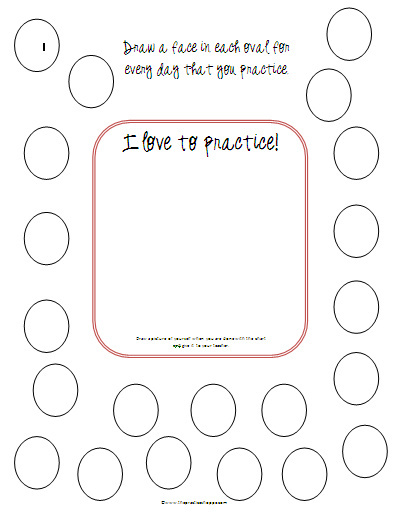 So Many Practicing Ideas - So Little Time! Four kids is a lot to handle and do everything else I want to do! I never seem to have time to do everything, but I have been working a lot on starting a little business called The Practice Shoppe. Who knows if it'll work out or if I'll make any money, but I'm noticing that I have a little business side to me that I never knew about. Through all of this I have had so many practicing tips and ideas that I need to get more on the ball and update this blog! Every week it seems like I have a new chart idea and it always works for a few weeks. Perhaps if I share them with you something will click and you'll find something that you love! Some of my students are faithful at marking off their practice guide each week. Others - never look at one. I recently put in the parent's hands to fill one out if their child wanted to use it. My own 7yo dd is only a half and half practice guide person. 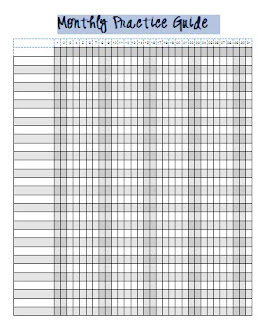 There are weeks when I will fill one out and use it meticulously. Other weeks I fill one out and it sits in the bag never to be seen again. Although my own daughter doesn't ALWAYS use a practice guide I still believe that it is the best way to practice most efficiently. Time is always an issue with practicing and rarely can we get everything done! 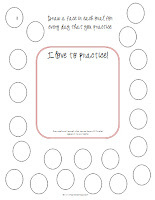 But with a practice guide we can equally practice everything each week - even if it is not daily. Of course, the new stuff is daily, but other things tend to slide when there isn't enough time. I feel like I put the same things on my dd's practice guide each week so I decided to make it a MONTHLY guide this month to see how it works. Check it out here under "monthly practice guide." I wrote all her books and exercises at the top, then gradually worked down everything she needed to practice including review pieces. So far the new practice guide got her attention and she wants to see how many x's she can put on the chart! This would also be a good chart for ONLY review songs. Good luck using it yourself.